I love, love, love bread. It is clearly one of the greatest cooking achievements ever made. I've been intrigued since I was a little girl - in fact, making bread is one of my first cooking memories. 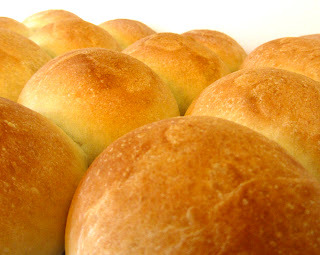 When I happened upon a recipe, by Jocatlin, at allrecipes.com for French Bread Rolls, I immediately wanted to try it. It's not that I've never made French breads before, just that I'm always looking for a great new one! This one is really good - tasty, smells great, right amount of chew. Lovely! Plus, it was really quick and easy. So, next time you want some wonderful fresh bread - why not make it yourself? These rolls are definitely better than anything you're going to get at the supermarket! Yummy! 1. Place 1/4 cup of the water in a small bowl. Gently stir in the sugar and yeast. Let the yeast bloom for five minutes. 2. In a the bowl of a food processor, stir 2 cups of the flour together with the salt using a wooden spoon. Add the vegetable oil, yeast mixture, and remaining 1 1/4 cups water. 3. Stir rapidly with the wooden spoon (or use the paddle attachment) until the mixture is completely smooth. 4. Add 1 1/2 cups of the remaining flour. Stir with the wooden spoon to form a shaggy dough. 5. Using the dough hook, knead the dough in the mixer for 5 minutes or until smooth and elastic. As the dough kneads, add more of the remaining flour a little at a time, if it is at all sticky (I ended up using 3 1/4 cups flour total). 6. Form the dough into a ball. Lightly oil the bowl. Place the dough upside down in the bowl and turn to coat. Cover the bowl tightly with plastic wrap. Let rise in a warm place for about 1 1/2 hours or until doubled in size. 7. Line a baking sheet with parchment paper. 8. Gently flatten the dough. Cut it into 16 equal pieces. Roll each piece into a ball. Place each ball on the baking sheet, evenly spaced. Cover the baking sheet loosely with a damp cloth. Let rise in a warm place for about 45-60 minutes or until the balls have doubled in size. 9. Preheat the oven to 400°. 10. Remove the cloth from the bread. Bake for 15-20 minutes or until the rolls reach an internal temperature of 200° - 210°. 11. Transfer the rolls to a rack to cool. Serve! *Note: the original recipe suggests using a egg wash for a shiny crust (1 egg white beaten with 1 tbsp water, brushed on just before baking). I didn't use the glaze for allergy reasons, but recommend it! The effort is minimal and the outcome beautiful!